Arizona OB/GYN Affiliates brings the concept of hope to life in its direct-to-consumer multimedia marketing campaign. Healthcare affects everyone on a very personal and emotional level.It’s an industry centered on life and death. Patients and their loved ones are affected physically, mentally, and emotionally—whether its parents bringing their first child into the world, or a father hoping he’s healed enough to walk his daughter down the aisle at her wedding, or a family concerned about making their grandmother’s final days peaceful and painfree. It’s no secret that emotional connections can build trust and brand loyalty with consumers. The same is true in healthcare marketing. The challenge healthcare marketers face is determining how to forge that emotional connection with people in a manner that differentiates them from every other healthcare organization. Let’s face it—every hospital can claim that they are committed to excellence and provide compassionate care to patients. The key is finding a way to cut through the noise to truly connect with people and impact the decision-making process. Here are three tips to help you find the right emotional connection for your target audience. What emotional traits do you want to express? Do those emotions represent your brand? Is there a larger theme that you can attach to the emotion? Think about Nike’s “Just Do it” marketing campaign. It doesn’t just strive to inspire elite athletes. It aims to inspire everyone, because anyone can be an athlete. It also taps into the larger social issue of obesity and the challenges of living a healthier life. It uses inspiration and real-life stories of everyday heroes to not only emotionally connect with consumers but to get them to live a healthier life and be more active. Strike a balance between emotional- and rational-based marketing. Today, consumers have a larger role in healthcare decisions than ever before. Patients no longer simply go to the hospital or imaging center that is closest to them. Now, people are asked to review Health Grades, Top 100 lists, or the Hospital Consumer Assessment of Healthcare Providers and Systems (HCAHPS) survey in order to decide where to receive the best care based on quality, performance, and cost. Yet, people don’t make healthcare decisions based solely on those awards, outcomes data, or cutting-edge technology. People also factor in whether or not they feel safe, the facility is clean, friends or family had a positive patient experience, and staff members take the time to answer questions and earn their trust. That is why it is essential that healthcare marketing agencies and in-house marketing staff focus on emotion-based marketing as part of their overall strategy.Healthcare marketers should find balance between showcasing the fact that an organization provides high-quality medical procedures and has cutting-edge facilities with the fact that it also supports patients and family members on a personal level. Make sure your emotion-based marketing campaign is genuine. To build a successful emotion-based marketing campaign, it is crucial that the emotions you are promoting are genuine. If your campaign is centered onhope, then the entire patient experience should embody that hope. Your marketing will fall flat and it could also be damaging to your brand to promote an emotion that is not reflected by your organization. Think about all of your patient materials, procedures, and communication strategies to ensure that they align with your overall message. Arizona OB/GYN Affiliates’emotion-based marketing campaign connects the concept of hope with one its core values—family. Patients have the right to the best doctors available. Doctors play an integral role in the lives and the well being of both their patients and their patient's families. While patient safety is paramount, compassion trumps business efficiency and uncommon courtesy must be an everyday experience. Belief in the power of family, the strength of unity, the importance of listening and the respect that comes from understanding. 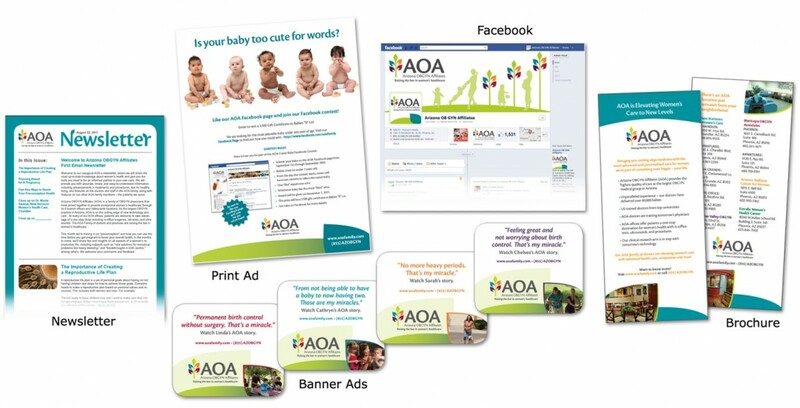 AOA’s marketing campaigns more than doubled its website viewership and new patients increased by more than 35%. Today, AOA isone of the largest and most prominent OBGYN groups in the state—proving that emotion-based marketing campaigns can have a big impact in the healthcare industry when done right.